I have promised – Now what? As a local church we have raised $65,000 for the vision we shared last week. You can still give or pledge today and be part of the whole team who are giving. Now that you have planned to give towards a Kingdom Project what is the next step? Sow a seed to kick start your flow. 2Co 9:10 And [God] Who provides seed for the sower and bread for eating will also provide and multiply your [resources for] sowing and increase the fruits of your righteousness [which manifests itself in active goodness, kindness, and charity]. God says He gives to you the seed and the bread. He gives you seed for sowing. As any farmer knows, seed in the barn is not producing anything, it’s only seed in the ground that is multiplying. It is so very important hat you begin your pledge giving by putting some of it into the ground of Kingdom purpose right away. Every year some people think, “When I get some spare money I will put a chunk of it into the Kingdom Advance giving.” But as the year goes by that just never seems to happen, and when the end of the year comes there’s no opportunity to complete the giving pledge. If your seed is in the ground, something is working, you can’t see it yet, but something is happening. Mar 4:27 And then continues sleeping and rising night and day while the seed sprouts and grows and increases–he knows not how. Mar 4:28 The earth produces [acting] by itself–first the blade, then the ear, then the full grain in the ear. Mar 4:29 But when the grain is ripe and permits, immediately he sends forth [the reapers] and puts in the sickle, because the harvest stands ready. Something’s going on in that soil, the seed is at work, it’s a law of nature, but you must be patient. Just like the seed growing in the ground needs rain, so your seed needs to be watered with faith. Your expectation of the blessing of God is going to nourish and tend the miracle growing in the ground. If you are thinking all the time, “It’s hard times, I never have enough, I wish I didn’t give that money.” Then you will be making room for crop failure. God has promised to multiply your seed, so imagine it and see the vision fulfilled. Mat 9:28 When He reached the house and went in, the blind men came to Him, and Jesus said to them, Do you believe that I am able to do this? They said to Him, Yes, Lord. We rejoice in the opportunity to give to God. It is our love for God even more than our passion for the vision that inspired us to give. We are so happy that our gifts make a big difference to the lives of others, but it is our hearts to desire to show our love and appreciation to God for all that He has done for us, and so we give above and beyond. 2Co 9:8 And God is able to make all grace (every favour and earthly blessing) come to you in abundance, so that you may always and under all circumstances and whatever the need be self-sufficient [possessing enough to require no aid or support and furnished in abundance for every good work and charitable donation]. Isaac sowed in a time of famine and reaped 100 fold. Gen 26:1 AND THERE was a famine in the land, other than the former famine that was in the days of Abraham. And Isaac went to Gerar, to Abimelech king of the Philistines. Gen 26:12 Then Isaac sowed seed in that land and received in the same year a hundred times as much as he had planted, and the Lord favoured him with blessings. In this season of the Australian economy where the future seems uncertain, you have decided to be generous. Your faith makes room for God to sustain and bless you through what ever comes your way. We have an attitude that by faith we war a good warfare over our seed. WE are strong in faith believing that the promise of God is for His people to experience abundance. This promise is received by faith like every other promise. At times there are obstacles and challenges to faith, but we hold fast the confidence of our faith steadfast till the end. Asking God for His provision is making a demand upon His ability. Just look with me for a moment at the word “ask” and what it really means in this verse…. G1189, which involves the idea of urgent need); by implication to learn (by casual intelligence): – ask, demand, enquire, understand. Thus in this verse Jesus is saying make a demand of something due. To ask here implies great desire, even craving, as well as making a demand for something. This is not “If it be thy will, Lord” kind of prayers. This is storming the gates of heaven type prayers and “not taking no for an answer” type prayers. We are in for a season of financial strength and great blessing. Let’s rejoice in the Lord for His goodness. Christian Outreach Centre, one of Australia’s largest Christian movements, has elected a new Chairman for its Oceania region covering 24 nations with a combined population of some 37.7 million people. He is Ps Ross Abraham, former Queensland State Chairman for COC, and Lead Pastor for the Elevation multi-campus churches in Gold Coast, Tweed Heads and Townsville. Ross and his wife Kathy both come originally from Townsville, moving to Brisbane in 1986. He joined COC’s Brisbane staff in 1988 as Youth Pastor. Ross replaces Ps David McDonald, who had held the position of Australian National Chairman for 13 years. COC’s Oceania region, with some 55,000 members, has 700 churches, four major schools, a State-accredited tertiary college, several child care centres and Bible and ministry schools and Global Care, a disaster relief agency with 4000 registered volunteers. He said: “I take my new role very seriously indeed, and will dedicate my time and energy not just to building COC numerically and geographically, but even more importantly to develop stronger relationships between our churches and their local communities. “It seems all we hear about in the news is conflict and trouble – the role of the church should be to bring harmony, and to play a positive role promoting peace and unity in our nations, cities and towns. “Oceania is a big region, and I do not underestimate the challenges in terms of different cultures and traditions. But for me, it is more about what we are for, than what we are against. In a world of constant change, it is reassuring to know that faith communities like Christian Outreach Centre are growing strong … your global network of churches administer an antidote for the mounting stresses and complexities of this modern age … I am proud that COC and your disaster relief arm Global Care started in Queensland, but even more proud that your ministry and charitable works now extend way beyond our State lines – The Hon Campbell Newman MP, Premier of Queensland. phone 07 5597 2955 mob 0402 862 048.
phone 07 3457 1079 mob 0430 739 112. People sometimes complain about various things in church. Someone didn’t greet me, someone spoke against me, someone hurt my feelings. Sometimes we may even face a little persecution as people scratch our car, or let the tyres down or scream abuse at us just for being a Christian. But compare this with real challenges faced by God’s warriors the early days of the Salvation Army. In 1865 Booth was in the East End of London, preaching to crowds of people in the streets. Booth soon realised he had found his destiny, and later in 1865 he and his wife Catherine opened ‘The Christian Revival Society’ in the East End of London, where they held meetings every evening and on Sundays, to share the repentance that salvation can bring through accepting Jesus Christ as Lord and Savior to the poorest and most needy, including alcoholics, criminals and prostitutes. The Christian Revival Society was later renamed The Christian Mission. Slowly The Christian Mission began to grow but the work was difficult and Booth would “stumble home night after night haggard with fatigue, often his clothes were torn and bloody bandages swathed his head where a stone had struck”, wrote his wife. Evening meetings were held in an old warehouse where urchins threw stones and fireworks through the window. Outposts were eventually established and in time attracted converts, yet the results were discouraging. The Christian Mission was just one of about 500 charitable and religious groups trying to help the poor and needy in London’s East End. Booth and his fellow brethren in Christ practised what they preached and performed self-sacrificing Christian and social work, such as opening “Food for the Million” shops (soup kitchens), not caring if they were scoffed at or derided for their work. Booth preached inside the pubs in the poverty stricken East End of London. He was thrown out time and time again. One time after being thrown out of the pub with force and landing in the gutter he was pelted with rotten fruit and eggs. As troops marched down the street singing and playing their instruments, it was common for people to throw fruit vegetables and even dead cats at the joyful troopers. In one season of the fiercest opposition Booth commanded his troops in one part of England to stop marching down the street as the rocks thrown by protesters caused great injury to the troopers. They marched all the same and joyfully bore the marks of their persecution. When his daughter Evangeline was just 17 years old she went to Paris to preach the gospel with a few other young women. She would go into the pubs to preach but was thrown out over and over again. One night she tried again and they said to her if she did a jig on the bar they would let her preach, so jig she did and followed it up with a fiery sermon in French – her second language. When Booth was starting the Salvation Army God gave him a vision. Soon Booth was sending Soldiers out all over the world. George Railton went to America in 1880. One day in later life General William Booth was walking home, he was tired and old and on passing the bridge near his home he noticed a beggar sleeping under the bridge. Upon reaching home he chastised his oldest son Bramwell Booth who was about 40 for not seeing the beggar earlier and bringing him home for a meal. When lives like this one inspire us to live for Christ. Don’t be a complainer with tiny little troubles. Don’t think that life is just to be lived for our pleasure, the lost are calling out for help. Don’t be afraid to stand up for Christ, Australians are longing to see real Christians. We serve the same God that William Booth served. He changed the world with passion and service, it’s time for us to do the same. OCTOBER is stewardship month. It’s where we plan to make a big difference in the lives of others. Next week we are holding our annual fundraising dinner – it’s called the Imprints Dinner. You’re invited. It’s free of charge and we will be inviting you to pledge an amount of money to create a lasting Imprint in the lives of others. These people are table captains and have tickets. Please se one of them for a ticket. I invite everyone in this church to donate something towards the vision of changed lives. I encourage everyone to participate in the yearly giving. I have nothing to give – Let me tell you about Lois McGifford. Everyone can do something. You could give $5 a week? I pledged last year and my finances fell apart and I didn’t complete my giving. This season of giving ends at 31 October. IF you haven’t completed your pledge by then it is cleared… we hit the reset button. All uncompleted pledges are forgiven. This time around, sow something; because you must have seed in the ground for God to bless. Pray over your seed. Believe that God will return to you all that you need for your family and plenty over for the donation. All the church wants is your money. The truth is, all the church wants is changed lives. All Coles wants is your money, all Woolworths wants is your money. Think how many lives are ruined by the pokies, the races, drugs and booze – these are the things that take the money from peoples lives and create ruin and destruction. The church creates life and brings answers to people to help them. Here’s where your money will go this coming year. Community Kitchen – free lunch and dinner – feeding people every week. Now food parcels are commencing. Assault on Family Violence – this church is part of the answer to help the worst family violence region in Victoria – right here on our doorstep. Destiny Rescue – saving little girls from a life of sexual exploitation. Now operating in 6 nations. Here’s what your kind donations have achieved this year. Community Kitchen – Provided over 5000 meals this year. The giving is not just the food but the love and acceptance of lonely and hurting people in our community. New Church Commenced – We planted the new church into south Yarra with AJ and Bronnie. At the present time there are approximately 50 members in the church and AJ and Bronnie are seeing people saved and lives changed. Destiny Rescue – This calendar year alone 150 girls have been rescued out of Sexual slavery in Thailand and Cambodia through the work of Destiny Rescue. THANK YOU – THANK YOU – THANK YOU to everyone who gave over the last 12 months. Do you know the story of George Muller? There’s a story about leaving an imprint on many lives. You have the opportunity to leave your imprint on many lives. 27 September 1805 – 10 March 1898), was born in Germany and later came to England as a missionary. His early life was not marked by righteousness – on the contrary, he was a thief, a liar and a gambler. By the age of 10, Müller was stealing government money from his father. While his mother was dying, he, at 14 years of age, was playing cards with friends and drinking. Later, a fellow student (Beta) who invited him to a Christian prayer meeting. There he was welcomed, and he began regularly reading the Bible and discussing Christianity with the others who attended the meetings. After seeing a man praying to God on his knees, he was convinced of his need for salvation. As soon as he got home he went to his bed where he knelt and prayed. He asked God to help him in his life and to bless him wherever he went and to forgive him of his sins. He immediately stopped drinking, stealing and lying, and began hoping to become a missionary. He was a Christian evangelist and Director of the Ashley Down orphanage in Bristol, England, which cared for 10,024 orphans in his life. He was well known for providing an education to the children under his care, to the point where he was accused of raising the poor above their natural station in life. He also established 117 schools which offered Christian education to over 120,000 children, many of them being orphans. The work of Müller and his wife with orphans began in 1836 with the preparation of their own home at 6 Wilson Street, Bristol for the accommodation of thirty girls. Soon after, three more houses in Wilson Street were furnished, growing the total of children cared for to 130. In 1845, as growth continued, Müller decided that a separate building designed to house 300 children was necessary, and in 1849, at Ashley Down, Bristol, that home opened. The architect commissioned to draw up the plans asked if he might do so gratuitously. By 26 May 1870, 1,722 children were being accommodated in five homes, although there was room for 2,050 (No 1 House – 300, No 2 House – 400, Nos 3, 4 and 5 – 450 each). By the following year, there were 280 orphans in No 1 House, 356 in No 2, 450 in Nos 3 and 4, and 309 in No 5 House. Although he never asked any person (only God) for anything, Müller asked those who did support his work to give a name and address in order that a receipt might be given. Müller prayed about everything and expected each prayer to be answered. One example was when one of the orphan house’s boiler stopped working; Müller needed to have it fixed. Now this was a problem, because the boiler was bricked up and the weather was worsening with each day. So he prayed for two things; firstly that the workers he had hired would have a mind to work throughout the night, and secondly that the weather would let up. On the Tuesday before the work was due to commence, a bitter north wind still blew but in the morning, before the workmen arrived, a southerly wind began to blow and it was so mild that no fires were needed to heat the buildings. That evening, the foreman of the contracted company attended the site to see how he might speed things along, and instructed the men to report back first thing in the morning to make an early resumption of work. The team leader stated that they would prefer to work through the night. The job was done in 30 hours. By the end of February 1835, there were five Day-schools – two for boys and three for girls. Not receiving government support and only accepting unsolicited gifts, this organisation received and disbursed £1,381,171 ( approximately $2,718,844 USD) – around £90 million in today’s terms – by the time of Müller’s death, primarily using the money for supporting the orphanages and distributing about 285,407 Bibles, 1,459,506 New Testaments, and 244,351 other religious texts, which were translated into twenty other languages. The money was also used to support other “faith missionaries” around the world, such as Hudson Taylor. The work continues to this day. Let’s think about George Muller’s life. There was gratefulness there for his salvation after coming to Christ from a miserable background. Are we truly thankful for what we have? Jas 1:17 Every good gift and every perfect (free, large, full) gift is from above; it comes down from the Father of all [that gives] light, in [the shining of] Whom there can be no variation [rising or setting] or shadow cast by His turning [as in an eclipse]. 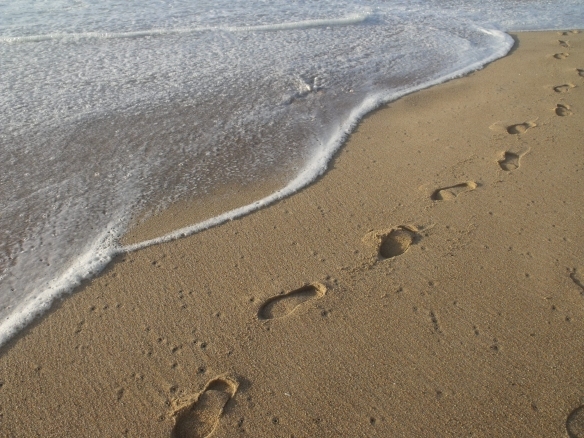 What would stop you leaving an imprint on many lives? When we want for ourselves and we fail to see the needs in others lives, then we may end our lives richer but morally there’s nothing in the bank. God says Pro 19:17 He who has pity on the poor lends to the Lord, and that which he has given He will repay to him. When you choose to be generous, you actually make room for God to bless you. Isaac sowed in a time of famine and reaped 100 fold increase. Gen 26:12 Then Isaac sowed seed in that land and received in the same year a hundred times as much as he had planted, and the Lord favored him with blessings. You can walk in faith. Choose to believe God that He will be your provider. Have faith in all that God has promised to you. Failure to see the big picture? Yes, what you do will make a huge difference. When we realize that we Australians are the richest people in the world don’t we have an obligation to do something for others? Failure to see the joy in giving. If I could just take you right now to the orphanage in Thailand and see the faces of the girls you helped to save this year, you would cry and you would doing everything you could to make sure that you did more for these precious lives. You’ve gotta be there for the impact, that’s why at the dinner we do video ad pics of the impact of your giving. GOD SO LOVED HE GAVE HIS ONLY BEGOTTEN SON. NOW WE ARE HIS OFFSPRING.